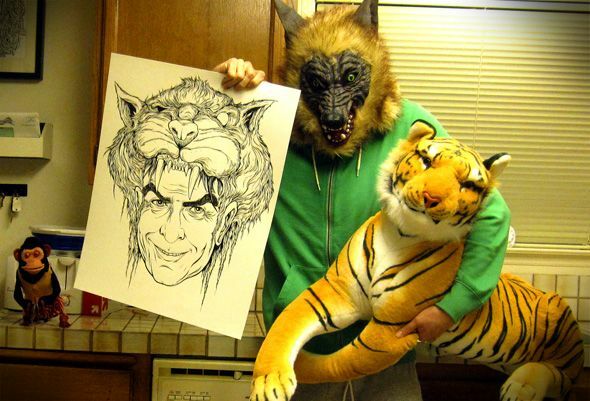 ALEX PARDEE'S LAND OF CONFUSION: WIN! WIN! WIN! TIGER BLOOD! WHY SHOULD CHARLIE SHEEN BE THE ONLY ONE WINNING!? 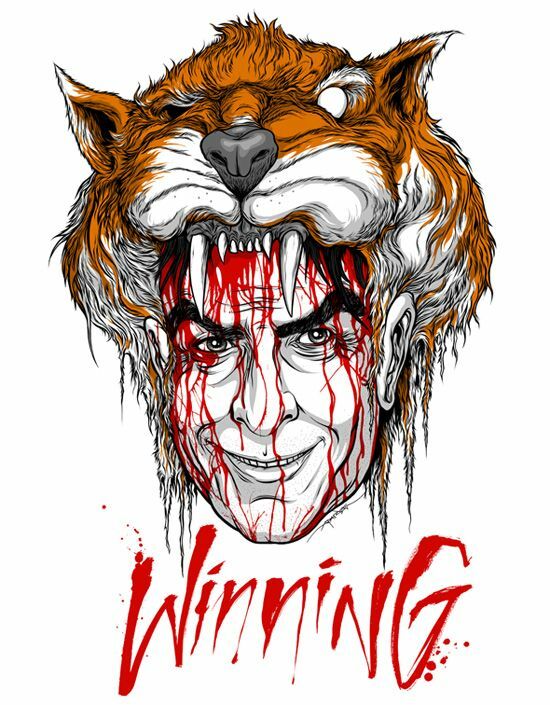 So, Charlie Sheen is all hopped up on an 8-ball of uncut Charlie Sheen and his tiger-blood seems to be pumping so angrily that he has gone a little MAD! Well guess what?! I love a little friendly competition between warlocks, so I decided to go a little crazy too!! In addition to stirring up a bloody (and 100% accurate) little homage to the only thing that has been able to unite us and distract us from Libya, Wisconsin & Egypt, I am also GIVING AWAY THE HUGE-ISH ORIGINAL DRAWING that I created for this print FOR ABSOLUTELY FREE! In honor of WINNING!!! So yes, HOW exactly can you win this one-of-a-kind flattened tree with a madman in a tiger hat on it?? Easy! But I'll tell you in like 3 seconds. But first…..
Zerofriends & I just released (in WINNING speed) a brand new signed (but not limited or numbered) print of a drawing I did of my favorite lunatic this week. But for the first time, my Adonis-laced DNA has allowed me to make this print available in 2 sizes: Full Size: 17" x 22" and mini-win size: 8" x 10. Here are all of the details, click on any of the pics or on the links to go view & purchase this print. Oh, and we are donating all of the profits to WINNING!!!!!! Before you leave here read below how you can also WIN the original drawing. 17" x 22" OR 8" x 10"
17" x 22" = $25.00 each, 8" x 10" = $10.00 each. Simply purchase ANY GICLEE PRINT ON MY WEBSTORE (ZEROFRIENDS.com) between NOW and THIS SUNDAY, March 6, at 11PM. Everyone who purchases a print will be entered into a drawing and Monday (March 7) morning I will draw a name and send you the original drawing. Take it from Charlie, it's THAT SIMPLE to WIN!!!! Now GO! WIN! WIN! WIN! Or else your face will melt off in front of your screaming children!